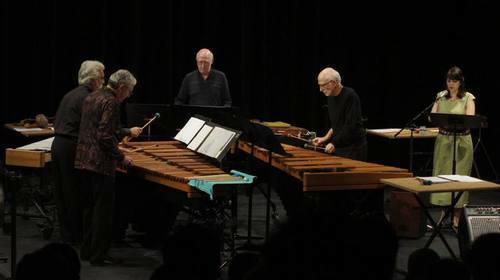 The most recent concert I did in June with Russell Hartenberger and NEXUS was very interesting for me. This was the first time that I worked closely with people from North America who come out of a certain period of that [musical] culture, which I didn’t know anything about. I started to think about how I connected with those people, and how we share many things. This is probably the first time that a non-Iranian musician has worked so precisely on Persian music. There are lots of examples of fusions and collaborations, but I think that the way that Russell approached this was very respectful. He dedicated months to working on a repertoire that was new to him, and he started arranging this music for NEXUS—I don’t know of anything similar. Hopefully this will open doors for members of NEXUS’ audience who are unfamiliar with Persian music, and certainly it’s opened a lot of doors for me. It’s also very interesting for Toronto’s Iranian community, and I realized this when we did our concert; they had never heard Persian music played exactly like this. Another interesting part of that concert with NEXUS was the surprisingly high percentage (if not the majority) of women in the audience that wore the Islamic veil or hijab. I think despite the growing polarization in Western societies around the question of Muslim communities and practices, it was really a great experience to see this audience coming to listen to a mixture of Persian and North American music and in fact enjoy it.